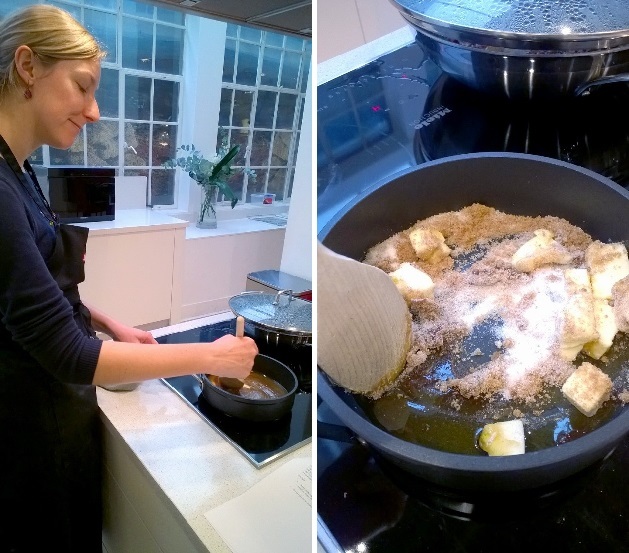 Back in November I was lucky enough to have the opportunity to take part in a Christmas Bake Off at Miele's London Creative Living HQ with a handful of lovely bloggers (aka my competitors). Alright it wasn't really a competition, it was just a baking event, making some Christmas gifts and using some hi-tech Miele products, but my work station buddy, Alex, and I would have won if it was. 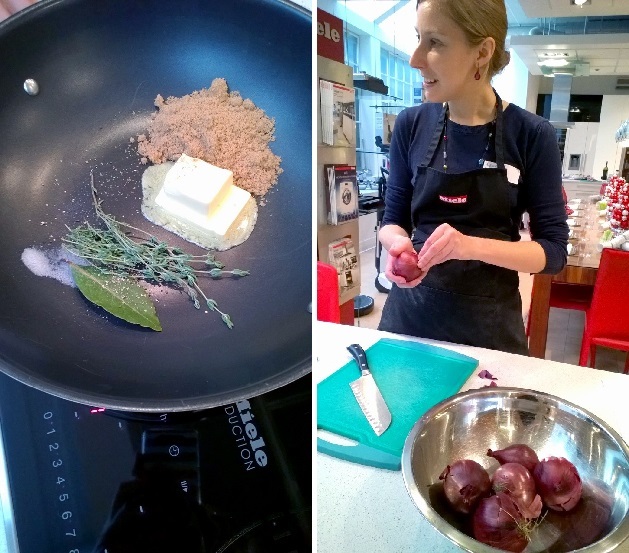 This win would have been assisted by our super friendly and helpful glamorous Miele assistant, who saved us from some burnt onion chutney, adding whole cherries to our truffles (which could have been delicious really! ), and generally cleaned up the massive mess Alex and I left in our baking wake. 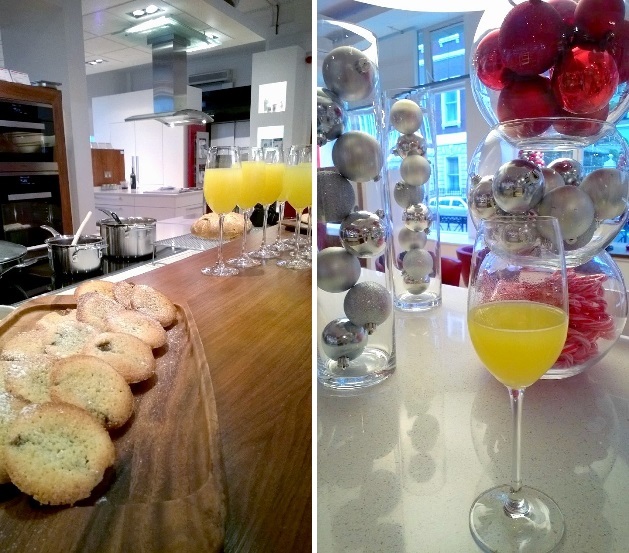 When we arrived we kicked things off with some bucks fizz, the official drink of Christmas, mulled apple juice and some frangipane mince pies the staff at Miele had prepared in advance. 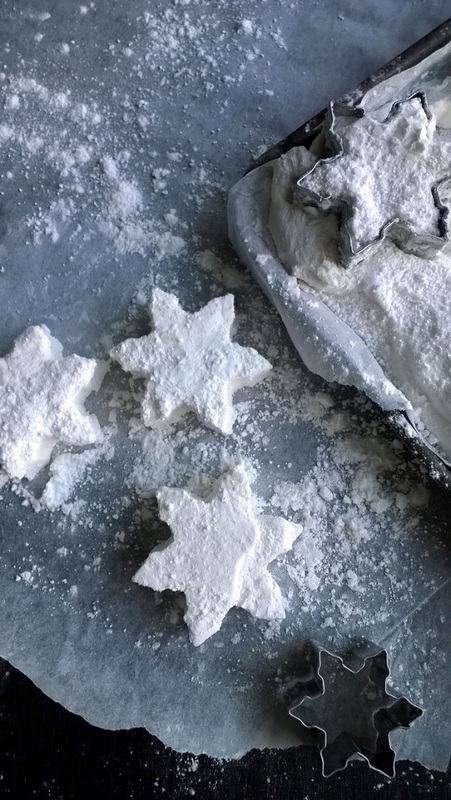 If you love frangipane and mince pies, this is your new Christmas favourite. I lost count of how many I ate but it was definitely more than my fair share. This was the second Miele event I had been to, the first being Miele's Chef's Table Event with Martyn Meid the brains behind Ink, the hottest Nordic inspired restaurant in town. It was a completely different event with us doing the cooking this time and enjoying a lunch that had been put together by the Miele team at the end of the session. We were spoilt rotten, with Miele organising us to make six Christmas goodies, including lemon and pistachio biscotti, red onion marmelade, chocolate truffles, salted caramel, panettone muffins and Christmas decorations. Biscotti is quite time consuming to make, as it has to be baked twice. However, with Miele's top of the range ovens at hand, and all the ingredients layed out for us it definitely speeded up the process. 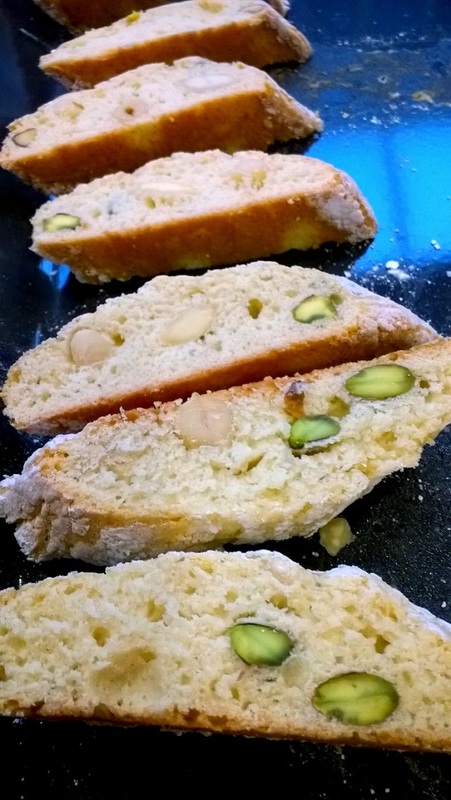 This lemon and pistachio biscotti with almonds and hazelnuts was delicious, and the flavours really came through from the lemon-infused oil. Something I haven't used before in baking but will definitely use in future bakes. Ingredients. 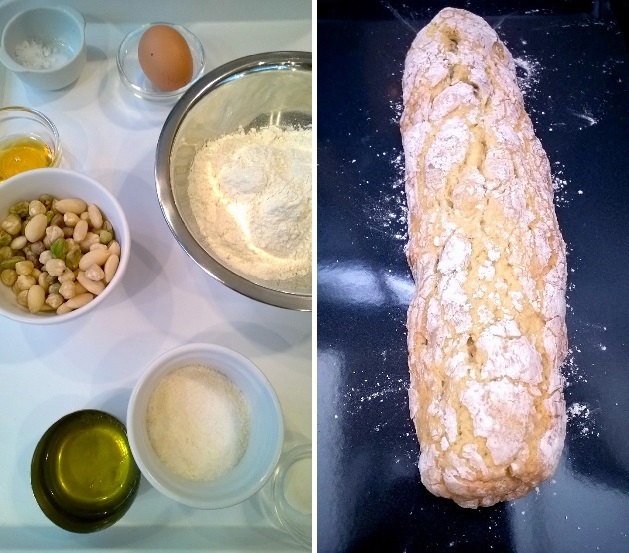 350g flour, 100g golden caster sugar, 1 1/2 tsp baking powder, 1 1/2 tsp salt, 40g honey, 2 medium eggs, 50ml lemon-infused olive oil, 50g pistachios, 50g hazelnuts, 50g whole almonds. Step 1. Preheat the oven to 145°C. Combine the dry and wet ingredients in separate bowls. Add the wet to the dry and mix together until well combined, then stir in the nuts. Wrap the dough in clingfilm and chill in the fridge for 30 mins. Step 2. 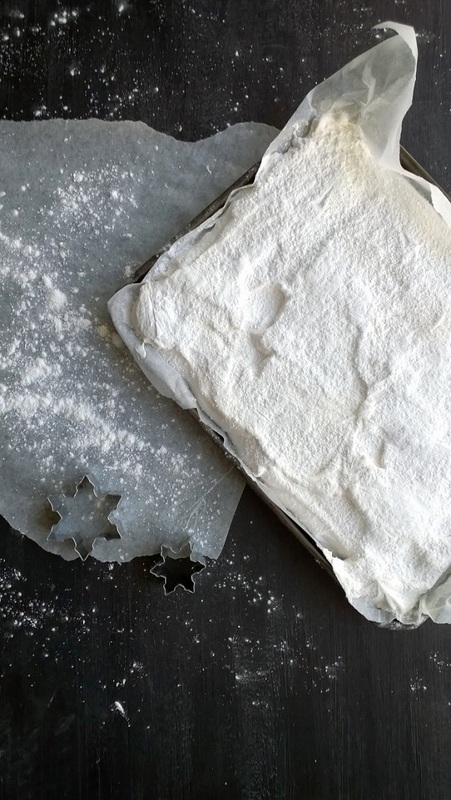 On a floured surface roll the dough into logs and place on a baking tray. Bake in the oven for 30 mins until the top of each log is hard to the touch. Remove from the oven and leave to cool. Reduce the oven to 135°C, and once cool slice the logs diagonally. Step 3. Lie the biscotti flat on a baking tray and bake for 10 mins, then turn them over and bake for a further 15 mins. Remove from the oven and allow to cool. Then eat. These will keep for 2 weeks. Red onion marmalade is one of my go to ingredients for a lazy night supper. You can stuff fish with it, throw it on top of a tart with tomatoes and basil, or melt it on top of chicken with some mozzarella in the oven. This was even easier than me making it at home, as Miele has a steam oven with a function for sterilization whereas I have a hot kettle. Ingredients. 1 tbsp olive oil, 50g butter, 600g chopped red onions, 1/2 tsp salt, 1/2 tsp black pepper, 1 bay leaf, 1 tsp thyme leaves, 50g light muscovado sugar, 100ml red wine, 75ml sherry vinegar. Step 1. Heat the butter and oil in a pan, add the chopped onions, seasoning, herbs and sugar, and cook on a low heat with the lid on for about 30 mins. Step 2. Add the wine and vinegar, then increase the heat and cook for 30 mins till the liquid has reduced by more than half. Remove the bay leaves and place in sterilised jam jars. Store in the fridge for months. I am not a huge chocolate fan, to many people's confusion. That being said if there's Brandy involved I'll probably eat it. And our truffles were quite heavy on the brandy. Ingredients. 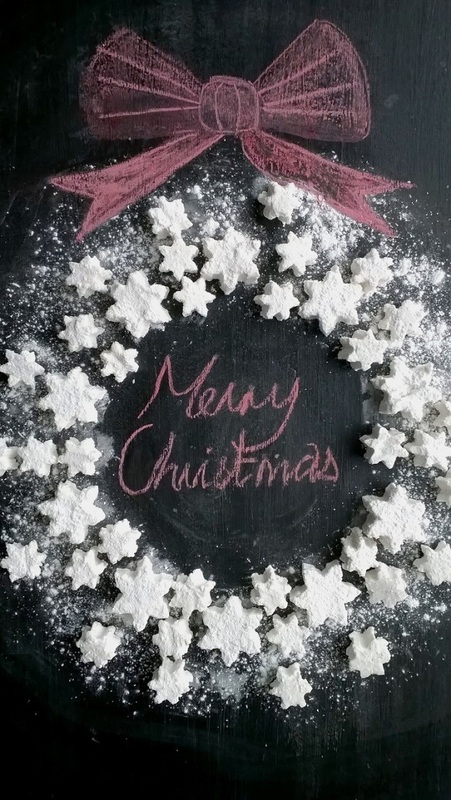 115g plain chocolate, 40g butter, 55g ground almonds, 30g chopped raisins, 6 chopped glacier cherries, 3 tbsp brandy, 55g icing sugar, cocoa, glitter and bronze crunchies to decorate. Step 1. On a low heat, melt the chocolate and butter. Take off the heat and stir in the rest of the ingredients and leave to cool in the fridge. Step 2. 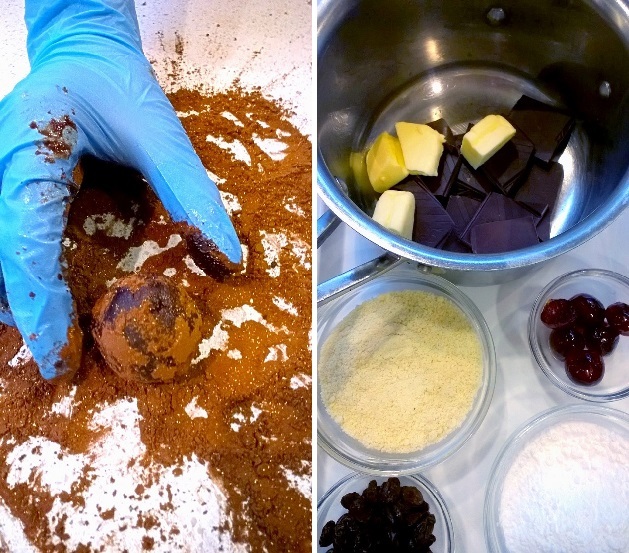 Once cool, roll the mixture into evenly shaped balls and roll each truffle in cocoa. Then you can decorate them however you like. 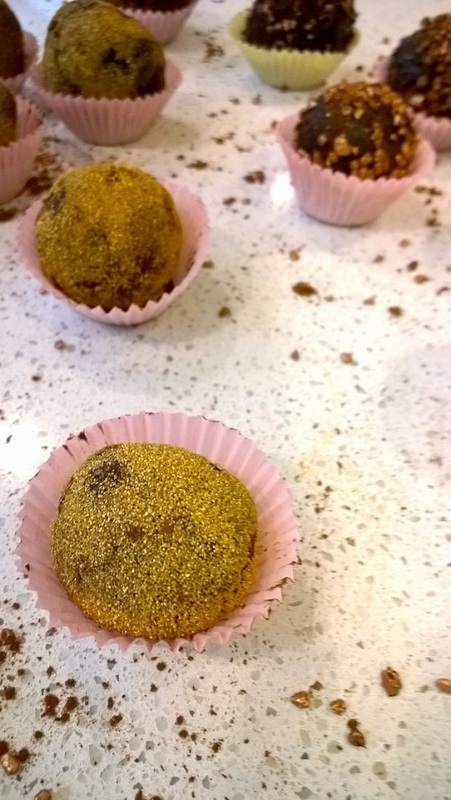 We rolled half of ours in gold glitter and half in bronze crunchies, just to add some sparkle to the already decadent truffles. You have two choices when faced with salted caramel eat immediately or save to slather on ice cream or even toast later. Ingredients. 75g butter, 50g light brown sugar, 50g caster sugar, 50g golden syrup, 125ml double cream, 1/2 tsp sea salt. Step 1. Melt together the butter, sugars and syrup on a low heat. Take off the heat and whisk in the cream and salt. 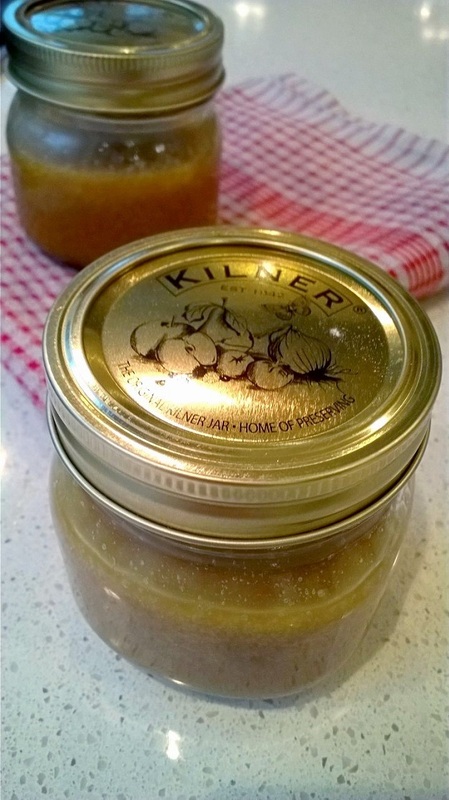 Place in sterilised jars and store in the fridge for months or eat immediately with haste. Thank Miele for their proving drawer is all I can say when faced with making panettone. I find it so difficult to prove things in our flat because living in a conversion everywhere is cold! So it was nice to not have to worry about swaddling the dough in tea towels in the airing cupboard or balancing it next to the radiator. Ingredients. 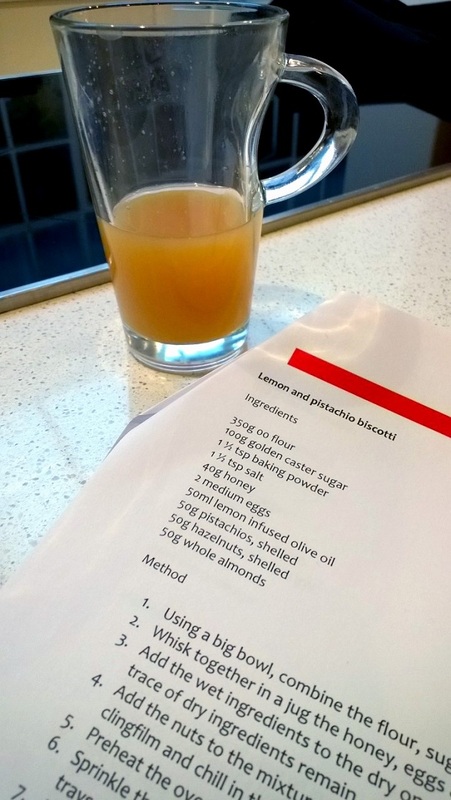 250ml whole milk, 30g fresh yeast, 900g flour, 100g mixed peel, 150g sultanas, zest of a lemon and orange, 1 tsp vanilla paste, 150g unsalted butter, 3 eggs and 2 yolks, 100g golden caster sugar, 2 tbsp honey, 1 tsp salt, icing sugar. Step 1. Combine the milk, yeast and 125g flour in a bowl, and set aside for 30 mins. Then add the remaining flour and knead for 10 mins. Cover the dough in clingfilm and prove for 40 mins. Step 2. 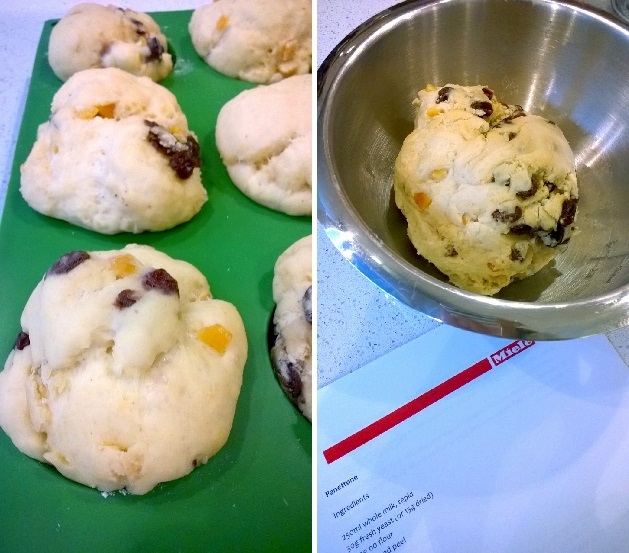 Knock the dough back and knead in the dried fruit, zest and vanilla, butter, sugar, honey, 2 eggs and both egg yolks. Shape the dough into 6 muffins and place in a greased muffin tin, cover with clingfilm and prove for 1 hour or until the muffins have doubled in size. Preheat the oven to 170°C. Step 3. 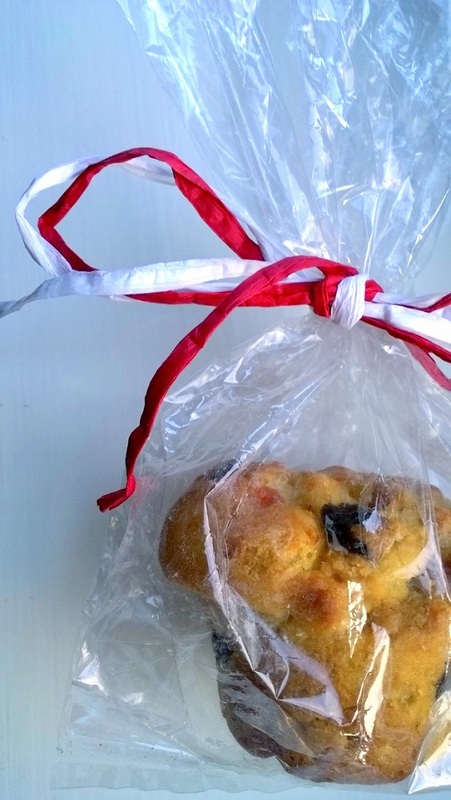 Brush the panettone muffins with the remaining egg and chill in the fridge for 20 mins. Then remove from the fridge brush with more egg and bake in the oven for 45 mins or until a skewer comes out clean. When done, remove from the oven and cool in the tin. 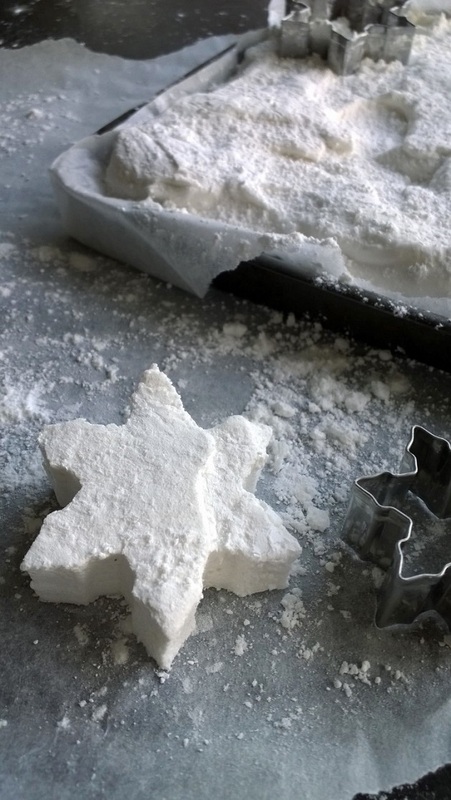 Once cool, dust with icing sugar and serve. After the cooking was done. 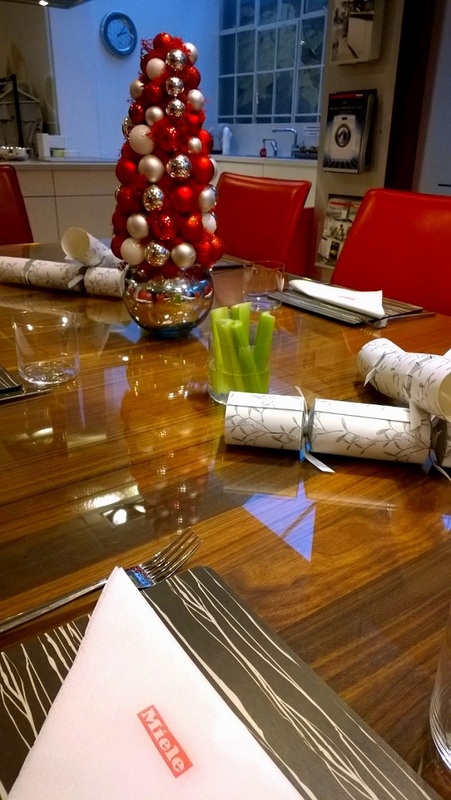 We were all tired out and ready for Miele's Christmas Ploughman's lunch. 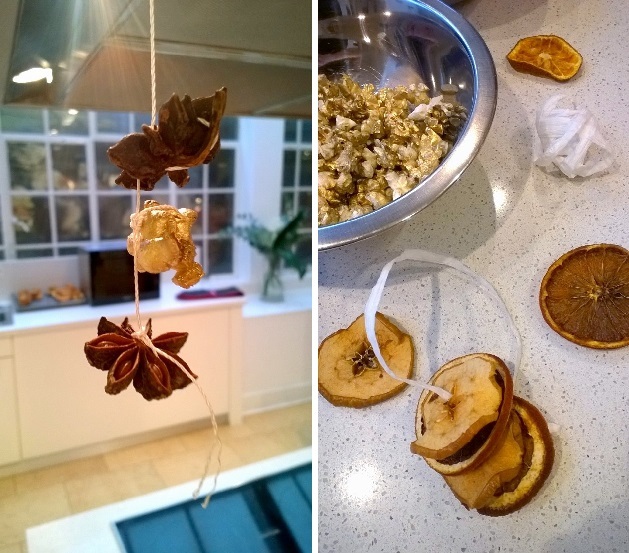 So after a quick go at making some Christmas decorations from non-edible gold spray painted popcorn (someone ate the popcorn but owing to the blogger's secret code I cannot disclose who it was but they did not look too happy afterwards!) and dried fruit slices it was lunch o'clock. 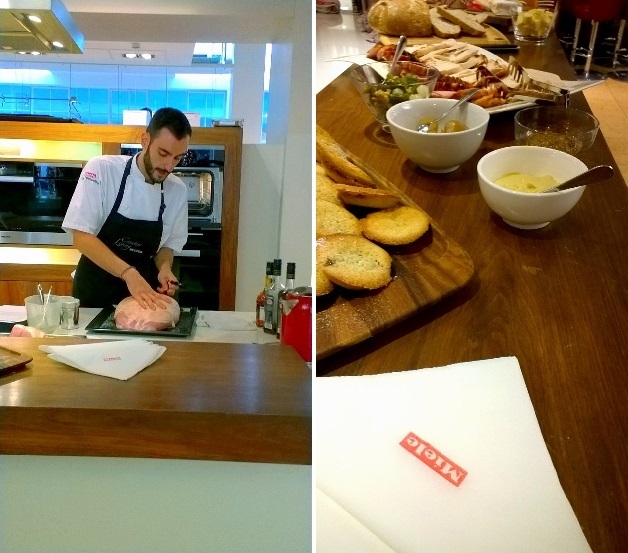 The Miele team had put on an amazing spread, with a whole roast ham and turkey roll, which they'd cooked to perfection in their steam ovens. 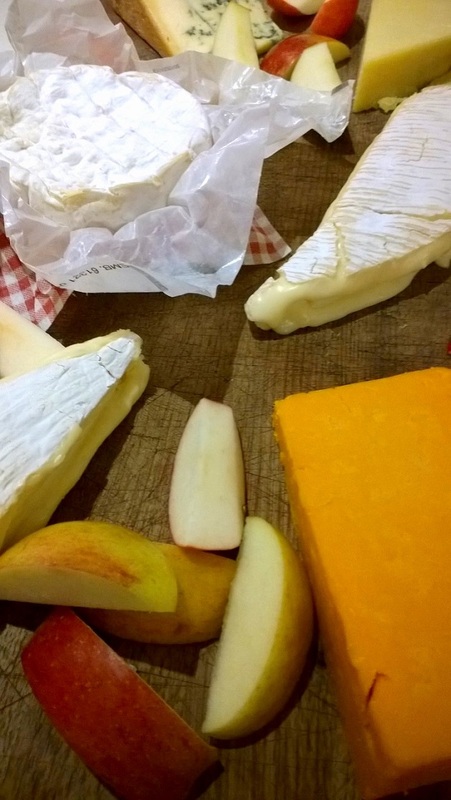 And of course it wouldn't be a Christmas ploughmans without the huge cheese board provided! It was absolutely delicious and the perfect end to a great event. And so I left Miele HQ laden with Christmas goodies, stuffed like a turkey, and with a longing for a Miele steam oven and proofing drawer of my own! I've raved about Miele's Creative Living events before here, but they really outdid themselves this time. They have a number of course coming up next year so if this sounds like something you would enjoy doing, have a look at what's on offer on their website. Thanks to Hannah from White for offering me the opportunity to review Miele's Christmas Baking Event and for sponsoring my attendance! All opinions are yours truly. I absolutely loved getting to know Cat from Oddly Lovely and Saskia from Girl in Brogues through the art of interviewing them, if you haven't seen the interviews yet check them out as these will be your two new favourite bloggers. Following on from interviewing Cat and Saskia, I am continuing to get to know about (and share with you!) 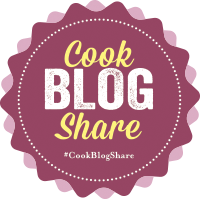 the lives and blogs of some of my other favourite bloggers. So without further ado let me introduce to you, or at least let you get to know a bit better, Lisa from Not Quite Enough. Not Quite Enough is a lifestyle blog, packed full of restaurant and bar reviews, travel snaps and first-hand reports on the latest events in town, while also featuring the occasional book review and general day to day life updates. This blog will become your pocket guide to where to eat, where to go on holiday and what to do on your days off, all of which are accompanied by great photos. And it is worth consulting the guide, of the restaurants she's been to quite a few have now made it onto my list of places to go, including DF Mexico, and Dinosnores at The Natural History Museum is only my dream sleepover. The history behind Not Quite Enough was that Lisa felt she wasn't getting enough out of London, she was stuck working hard and not playing as much as she wanted, so she decided to make more of London and start having some well deserved playtime. This is one of the reasons why I wanted to interview Lisa, as I was in the same situation when I first moved to London. Other reasons included her love for dinosaurs, where to eat recommendations and great taste in holiday destinations...she visited my home town (well, neighbouring town). In summary, I might be Lisa's number one blog fan. However, I'm open to challengers to knock me off my top spot, so go ahead and read the interview with Lisa below. First things first, as a fellow London lady with a taste for good food, where are the best places to eat in town? As much as I love eating out in wonderful restaurants with fancy food, I think that my favourite thing about the food scene in London is the vast array of street food purveyors. I love being able to eat food from a variety of cuisines and not pay a fortune for it. My favourite is Kimchinary who do the world’s most amazing Korean burritos. Their pulled pork burrito is definitely one of the best things I’ve ever eaten. They’re worth tracking down! 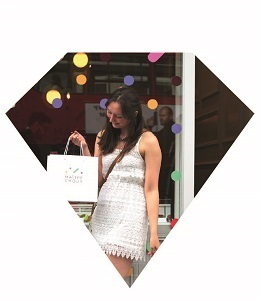 Having lived in London for 3 years, Not Quite Enough comes from you wanting to get more out of London and enjoying your life there away from the sofa, and you've certainly done that with going to the hottest new restaurants and events in town, do you ever think you'll have enough of London? I really don’t think I ever will. When I was a child we used to visit London every year to see a musical, and from the age of about 10 I decided that when I was all grown up that I would live and work in London. There’s something about arriving in London which sort of makes me feel like I’m able to relax, like I’m supposed to be here. A lot of people I know are now starting to move to the outskirts of London to buy a house, one eye on having a spare bedroom and a garden for children one day, but I love being so close to all the goings on and can’t ever imagine moving out to the suburbs, it just wouldn't be the same. We know a lot about what you like to do for play through your blog but what do you do for work? For work I’m a solicitor, practising in a firm in the city, so that keeps me quite busy and can involve some pretty long hours. It’s my dream job though, it challenges me and forces me to develop so many skills and I can’t really imagine doing anything else. I love that even the partners still encounter new and difficult questions and situations even though they've been doing the job for years, it’s impossible to get bored of it. The thing I enjoy the most about blogging is that it’s so different from my day job, I enjoy being able to explore my creative side through photography and being able to write without having to agonise over the precise meaning and formulation of my words. 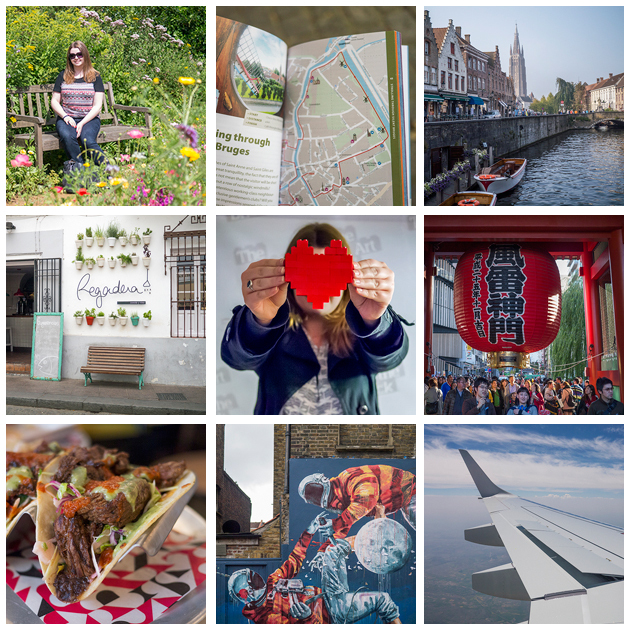 I've loved reading your posts and getting your perspective on exploring places, my favourites taking me down memory lane with trips to Margate and Bruges, but what's been your favourite place you've visited so far this year? I’ve loved being able to do quite a lot of shorter breaks this year and really make the most of my precious annual leave. I loved Cordoba, it’s a fantastic city for a few days and it has whet my appetite to see more of Spain. The surprise place of this year was Tokyo which was a last-minute (for me) business trip. Japan has been top of my wish list for a while now and so to get to go was amazing, now I really want to go back and see everything I want to see but couldn’t in my one free day there. Do you have any travel plans in the pipeline at the moment for next year? Absolutely none, which is killing me as I need something to look forward to. The exams for the postgraduate course I’m doing at the moment are in May so I think any annual leave I do take until then will mostly be used for essay writing, studying and revision. However, once that’s over I’ll be looking to get away and some of the places I’d love to visit include Prague, Budapest, Lisbon, Thailand, New Zealand, Vienna and Seville (just to name a few). What are your short-term/long-term goals for yourself and your blog and what are you doing to achieve them? In terms of personal goals, I’m currently studying part-time for a postgraduate diploma related to my area of specialism, if I pass well enough then there is the option of doing a second year which would involve writing a dissertation and which would mean I end up with an MA, which I’d love. So I just have to make sure that I work hard enough to be able to of the second year. I’m also dying to have a house of my own (after ten years of renting being able to have something of my own would be amazing) so I’m gradually saving for a deposit and stamp duty which in London is crippling. In terms of my blog, unlike a lot of bloggers, I have absolutely no desire to make it into a career or something I can make money from. I just hope that it will continue to inspire me to go out and do things, and provide a creative outlet for me to develop and improve my photography skills. I'm off to Hamburg in December, having lived there previously, do you have any suggestions on where to go? Oh exciting! I’m afraid I haven’t been there properly for a while now and so I can’t recommend specific bars and restaurants anymore, but the Schanzenviertel has a very cool East London vibe and should have some good options. The Reeperbahn (the red light district which also home to a number of bars and clubs) is tacky but is probably worth a visit. As for daytime activities, a visit to Michaeliskirche (and a trip up to the top) and St. Nikolai Kirche (now a war memorial) are must-dos for me and a walk around the Speicherstadt (the old warehouse district gives a flavour of old Hamburg. Located in the Speicherstadt is Miniatur Wunderland which, if I were to describe it as a model railway would be a massive understatement. It’s apparently the largest model railway in the world and spans several rooms and more than one floor, it's a whole miniature world, where every few minutes the lights go out and the little twinkly lights in all the buildings turn on. If you’re going in December though, I imagine the Christmas markets are the biggest draw. There are several dotted throughout the city with the biggest being in front of the Rathaus (town hall). I love the Christmas markets and my favourite thing to do after a day of lectures was to go down there with friends and hang out and drink Gluehwein and eat our way around the stalls. The mugs make great souvenirs if you’re happy to forfeit your deposit! Plus, three times a day in the afternoon, Santa ‘flies’ over the Christmas market, pausing in the middle to tell the story of Rudolph, it’s very cute. If travel was no issue what would be your perfect day out? And if the sofa was calling, your perfect night in? I must admit that I do love a good sofa night in and as I’m a girl of generally simple tastes, my perfect night in would involve a takeaway (pizza, Chinese or Indian), a bottle of wine, a packet of Fruit Gums and a few episodes of something not too emotionally or mentally taxing. Oh and probably my boyfriend too, although of course there's sometimes nothing better than some alone time - painting my nails, watching whatever I want to without compromising and not having to share food! What up and coming blogs have you followed recently? One of my favourite bloggers at the moment is Tamsin of A Certain Adventure, although I’ve been following for a while now she only started blogging in March and so I think she counts here. I love that her blog posts cover a wide variety of subjects and in such an intelligent way (plus, she loves a good dinosaur, as do I). Everyone should add her to their blog reader of choice. To find out more about Lisa and keep up with her travels visit her blog Not Quite Enough. 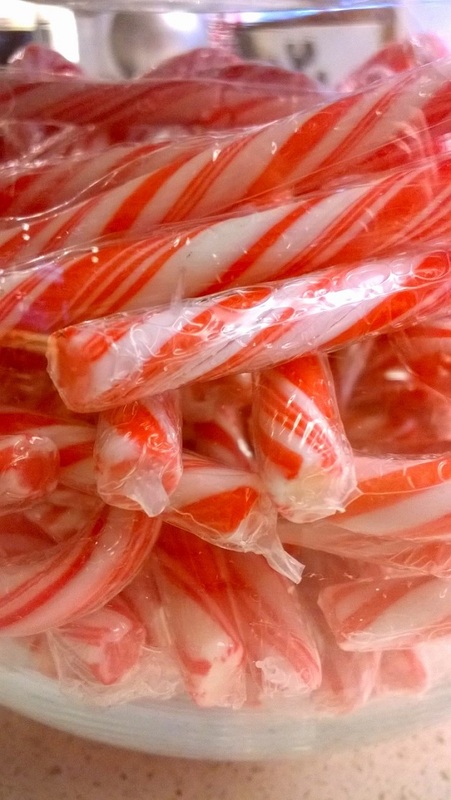 Has anyone else thought December's been pretty sneaky this year? There I was working hard in October, planning all these things to do when the Merry Month was upon us. And before you know it you're Christmas party's happened, mine was at the end of November, you've had weekend after weekend of Christmas meet ups, and the goose is cooking in the oven! I can help you. That's right I have not forgotten about Oh You Pretty Pins, it's just been a little while since my last one. In fact that's really an understatement as in my last Oh You Pretty Pins I was calling for an Indian Summer! 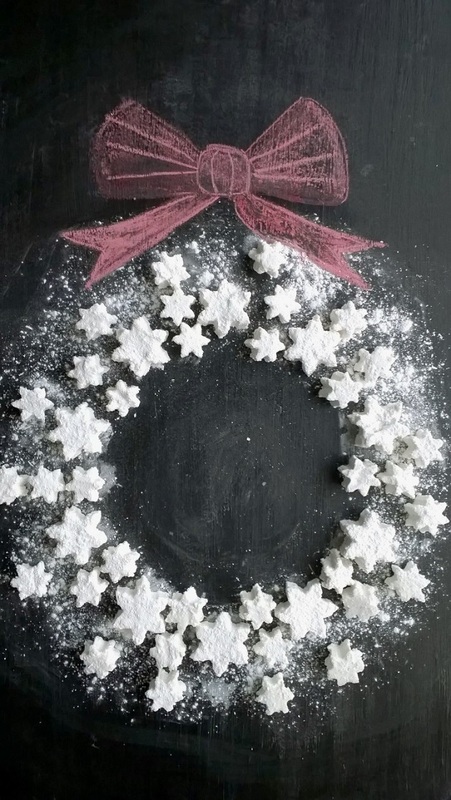 However, Oh You Pretty Pins is back, seasonal style! 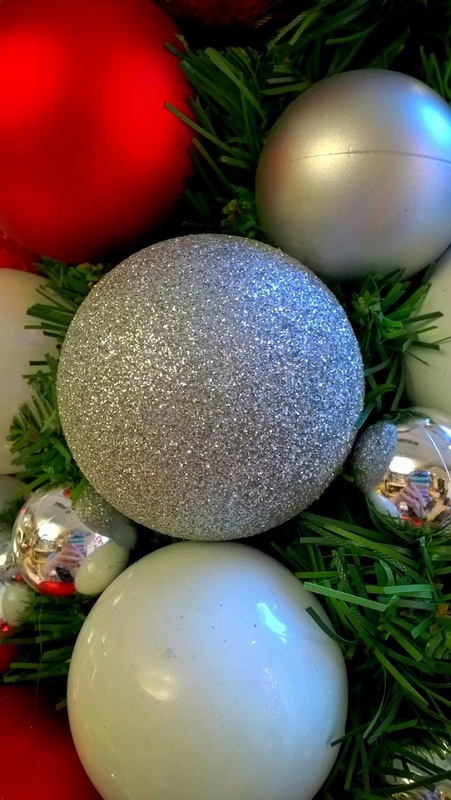 So in the run up to Christmas I will be sharing a couple of gift ideas so you can focus on the important things at Christmas. That's right, Muppet Movie reruns. 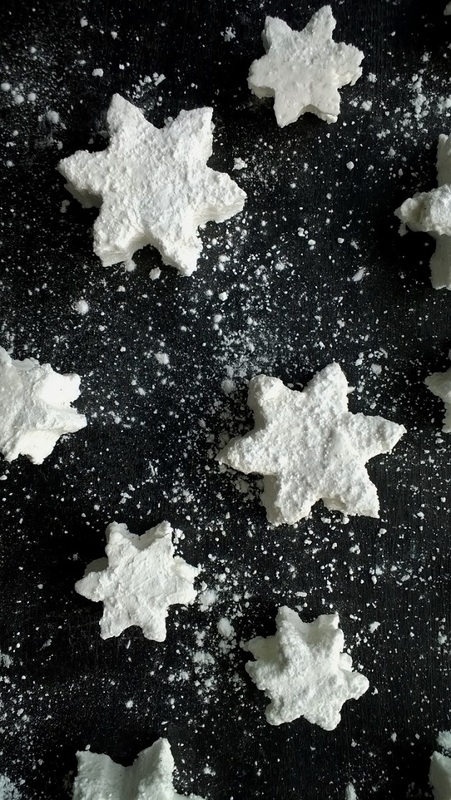 Foodie gifts who are they for? The short answer is everyone. And the long answer is everyone who loves food. And these are chosen by a food gift expert! I'm fine with calling myself a food expert, I've eaten a lot in my time and that makes me qualified. And if anyone want's to get me a Christmas or a birthday foodie gift* I'm fine with that too. *The curse of being a December baby is it's too much to hope for two presents. 1. I was given these oyster mushrooms from the Espresso Mushroom Company last Christmas. Tasty fun and not too expensive. Watch this time lapse video of them growing, they're incredible! 2. Cheese lover or not, everyone enjoys halloumi particularly if it's in a burger bun. And now you can make your own available from the Big Cheese Making Kit. 3. Oolong tea and Elderflower is an intriguing combination, add it to Absolut Vodka and you've got a Christmas cocktail just short of a mixer. 4. Ottolenghi stole my heart at his restaurant in Islington 3 years ago and has kept it since. I'm asking Santa for Plenty More this year to continue my love affair with Eastern/Mediterranean cuisine. Check out his hampers too, I can vouch that they are a dream! 5. I am well versed in Persian food, I haven't cooked any for a long time but I'd like Sabrina Ghayour's cookbook to be my guide back. 6.When I asked what my boyfriend wanted for Christmas he said 'to ride a tractor round a farm and get a box full of meat at the end', I'd prefer to skip the tractor and head to The Ginger Pig for a butchery class with a box of meat to take home and a two course dinner instead. 7. Buy these Goat's Cheese and Black Pepper Popcorn from Joe & Sephs at Selfridges. Put them in a bowl. Put your face in the bowl. 8. These mystical spices from the Alchemical Larder at Selfridges would make any cook feel like Hogwart's potions master. 9. 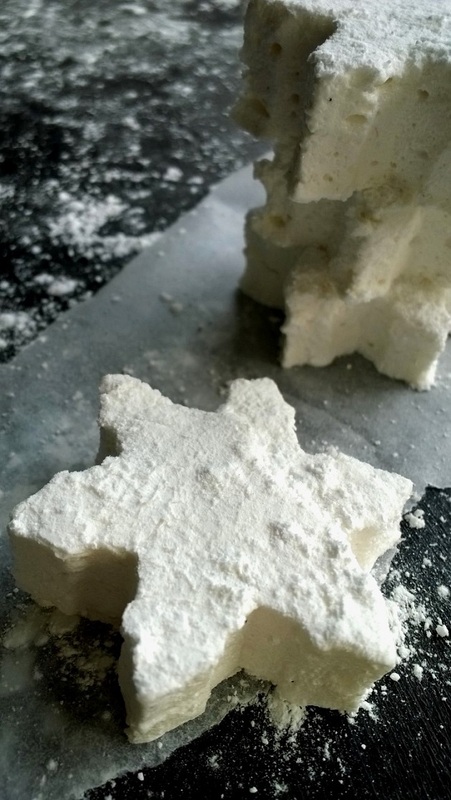 I'm a meringue lover, in fact, I'm a Meringue Girls meringue lover (see post here). Spot the sense in that one. Their class is on my fantasy Christmas list for sure. 10. And what do all foodies need while waiting for dishes to be done? A cup of tea of course! I have my eye on these caffeine free Rose and Elderflower Pyramids from Selfridges.